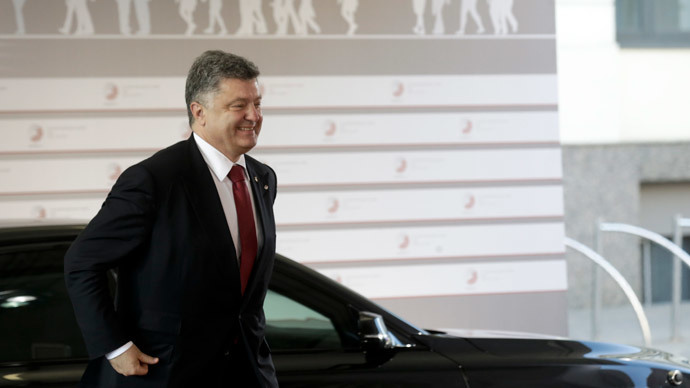 Ukrainian President Petro Poroshenko has signed into law a bill that allows the government to set a moratorium on the repayment of foreign debt. The law comes into force once published and remains valid until July 2016. The government and the municipalities of Ukraine have been given the right to suspend the repayment of foreign debts until they agree with the lenders on changing the terms of refunding them, the President’s websitereports. The Ukrainian parliament adopted the draft law on May 19. The government then explained that the moratorium was needed due to the complicated financial situation in the country. Ukraine has to pay $30 billion in foreign exchange obligations in the next four years alone. The moratorium does not mention Ukraine’s bilateral, multilateral or domestic commitments, as well as the debts to the IMF, the EBRD and other institutional lenders. However, the bill says the $3 billion in Ukrainian Eurobonds purchased by Russia at the end of 2013 are on the list of liabilities subject to a possible payment moratorium. Ukraine is due to pay off $75 million in Eurobonds to Russia by June 20, said Russian Finance Minister Anton Siluanov earlier in May. If the payment isn’t received, Russia will take legal measures. The total debt of Ukraine is estimated at around $50 billion, of which $30 billion is external debt and $17 billion is internal debt, according to the country’s Prime Minister Arseny Yatsenyuk.